Although the first reflectors (oil lamps enclosed in metal structures) appeared in Paris in 1765 and the first gas lamps followed after 1829, the city remained poorly illuminated until the Second Empire, when thousands of new lamps were installed throughout the city. 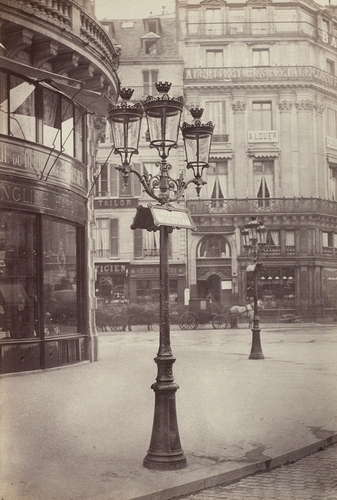 In the early 1860s Marville undertook a commission to document the numerous stylistic variations in the lampposts, which had been designed for specific sites throughout Paris and were installed with great care to maximize the appearance of regularity, harmony, and order. The most ornate designs, such as this candelabra on the avenue de l’Opéra, were generally reserved for the most luxurious neighborhoods.